W hat should a creditor do if a debtor sends a check with the notation: “paid in full” or other similar language, but the creditor believes a greater amount is owed? Does cashing the check settle the claim, thereby preventing the creditor from pursuing further collection? What happens if creditors cash this check without realizing the check was restricted? California has two statutes addressing the issue, and they contradict one another: Civil Code Section 1526, and Commercial Code Section 3311. The conflict was addressed in Woolridge v. J.F.L. Electric (2002), 96 Cal. App. 4th Sup. 52. The court held that the more recently enacted Commercial Code Section trumps the conflicting Civil Code Section. The Commercial Code section is more restrictive than the older Civil Code section. Therefore, with some major exceptions explained below, negotiating a check marked “payment in full” or similar language does constitute a settlement of the claim under current California law. Given the ruling in Woolridge, the only foolproof way to avoid satisfying the debt in full is to return the restricted check uncashed. Although the Civil Code allowed the receiving party to cross-out the restriction and cash the check without settling the claim, the newer Commercial Code section makes no exception. A creditor could cross-out the language and cash the check anyway, and, if the issue arises, rely on the Civil Code. Giving the ruling in Woolridge, however, the creditor would probably be found to have settled the claim. The only surefire way to prevent satisfaction of the debt is to return or destroy the debtor’s check. But I Already Cashed It! It frequently occurs, however, that the creditor only realizes the check was restricted after it has been cashed. If this occurs, there is no need to panic. The Commercial Code section has a safe harbor provision to prevent unintentional settlement of claims. As long as the creditor returns the funds to the debtor within 90 days of payment of the instrument, there is no satisfaction of the debt. Be sure to return the funds as soon as possible, and include a letter stating that you do not agree to settle the claim for the amount of the check. Send the letter via certified mail. It is likely the debtor will not cash the check, and will try to present his check as evidence of settlement if and when the matter is litigated. However, if you can prove you mailed the funds back within 90 days with a letter disavowing the settlement, that should defeat the debtor’s claim of satisfaction. Even if the creditor cashed the check, and more than 90 days have elapsed, there is still hope of collecting the entire balance. The statute places two requirements on the debtor: the compromise must have been sent in “good faith,” and the claim must be unliquidated or subject to a “bona fide” dispute. For example, a bankruptcy court, applying the California Commercial Code section, found that a check marked “paid in full” to a landlord for partial payment of past-due rent did not constitute a satisfaction, because there was no legitimate dispute to the amount of rent owed when the check was tendered. It is possible to imagine a similar argument being successful for a partial payment of the price of goods or services, unless there was some dispute regarding the quality or price before the check was tendered. One of the few California appellate cases upholding an accord and satisfaction based on the restricted endorsement of a check is Woolridge, cited above. In that case, an insurance company issued a check for payment of a bodily injury claim. The check was marked “payment in full” and included a letter stating that the amount was being offered as settlement of the claim. The insured cashed the check, but then sued to collect more. The trial court found there was a dispute as to the amount owed, that the check was offered in good faith, and that therefore the claim was satisfied and no additional amount could be collected. If you receive a check from a debtor marked “paid in full” or similar language, and you are not willing to accept the amount of the check as full payment of the account, the only safe action under California law is to destroy or return the check uncashed. If you have cashed a restricted check, California law gives you 90 days to return the funds without settling the claim. 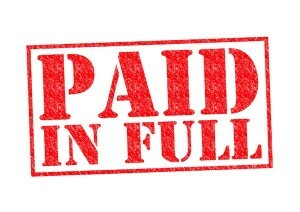 Further, even if you negotiated a restricted check, you may be able to avoid satisfaction if the debt was undisputed, or if the debtor did not act in good faith.